At SportTracks we value letting you control your data. Which is why from Day 1 of our launch we’ve been more than just a “viewer” and offered robust editing options — for when a sensor dies, your GPS glitches, or you just forget to hit stop at the end of a ride. Today we release a new feature that allows you to trim sensor data that your device records or split workouts entirely in two. This isn’t a big complex feature or one you will use very often, but it’s nice knowing that it’s there if you need it. The most common scenario we see that calls for trimming is when an athlete forgets to turn off their GPS after a run, ride, or swim. Once your workout lands in the system you’ll see a time and distance that is way too long, a section at the end where your speed suddenly jumps, or a GPS trail that wanders off. Fixing this is easy. And importantly — using the new trim feature will recalculate any summary and performance metrics (including effort, normalized power and level pace) using the trimmed sensor data, so you don't have to manually update those like you would if you just edited the time or distance. You can trim and discard recorded sensor data from either the start or end of a workout, or you can split the workout in two pieces at a particular point in time. 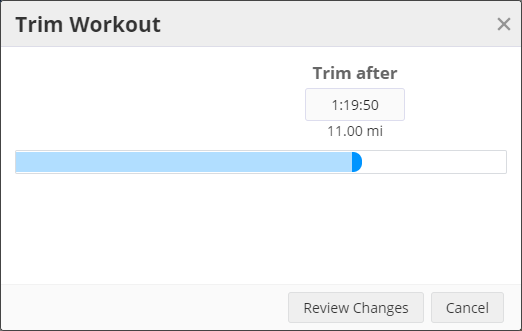 For indoor (trainer/treadmill) or GPS based workouts you can select an exact time to trim to. For pool workouts the trim time is limited to the ends of pool lengths; you cannot trim a pool length in the middle. Select the time you want to trim or split at using the slider or enter a specific time. If your workout was recorded outside or has footpod or speed/cadence distance info you can also see the distance at the trim time. Click Review Changes to advance to the last step of the trim action. As the warning states any changes you make are permanent and can’t be reversed; double check the details before you click ok! 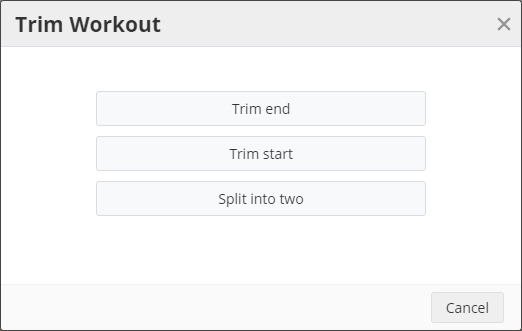 If a "split" option was selected, the trimmed data is saved to a new workout. Our new split and trim feature continues the mission to put you in control of your data. It's the kind of tool that everyone needs from time to time, yet it's sorely missing from the majority of competing platforms. We care deeply about your experience using SportTracks, and we want to give you every tool you need. 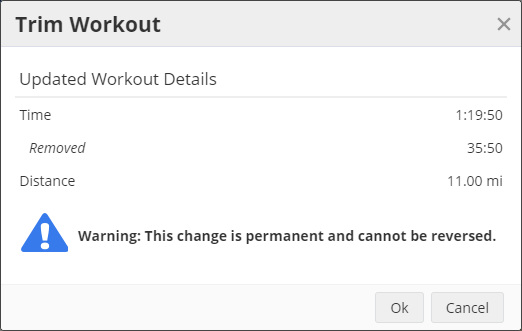 Enjoy your new workout trim feature, and look forward to what we're working on next! Should you use a sports watch to track your swims? I will appreciate this one next time I forget to stop the GPS. But the one I would love to have should tackle the following pain point : no more battery on the GPS 15' before reaching the end of the workout, partial track. Once it is upoaded, I would like to edit the track, draw my path on the map and have the system compute my stats based on the average speed since the beginning of workout ... not perfect but better than no stats and wrong distance. In fact, I loved it on SportTracks Desktop. I would apreciate to merge two workouts. It occurs when I stop reccording at a wrong moment (problem with the device for example) and decide to continue the workout. I would like to add the possibility export the the original data based on the trimmed time frame. Fit format export is needed for that.